I am putting all the engines, coaches and trucks I have collected in here. Complete with any useful information and notes I think pertinent. Click any image to see a larger version. The breakdown crane set. Put together for use on 2 or 3 rail. This is an early example in matt finish and metal couplings. 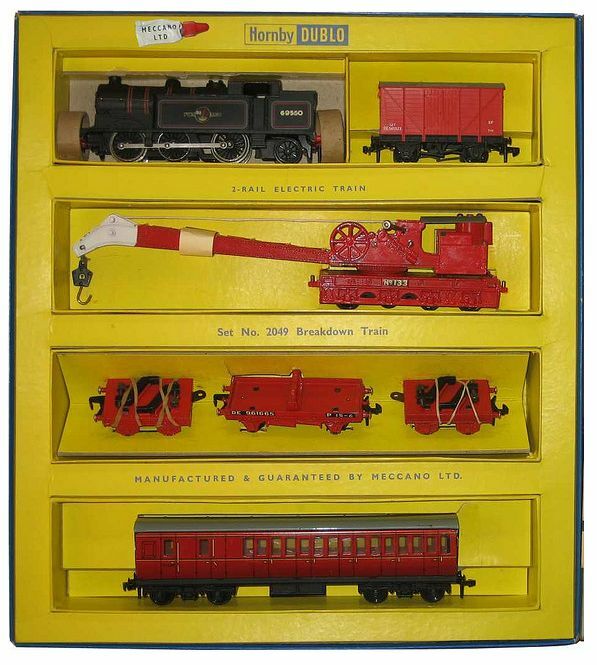 As a 2 rail set it would have come with an 0-6-2 loco, packing van and suburban brake 3rd coach in a large box but I have managed to locate these extra bits and I have these on order. Here is the 2 rail version. The final engine i was bought was the Co-Co diesel. This is a bit of a cheat. Original chassis with a new body diesel. Bristol Castle 4-6-0 or is it Windsor Castle?? This Bedford flat top with a new tractor as a load not the original Hornby one, but great value at 3 for £10! and such detail!! This Austin truck had to be repainted as it was in such poor condition but as near original as possible. This little pickup, again touched up as it was in poor condition. Good old Ford Prefect. The first car I ever owned and drove for several years. The bottom half of mine was light blue as 90% of those panes were fibre glass hiding extensive rusting to the bottom of the doors and wings! Reg: FPL 301 and sent to the scrap yard for £5 in the early seventies! A further collection of trucks and tankers, some old, some newer super detail with the plastic couplings.